2016 has been a good year for Escape Manila. I have accomplished a lot in terms of ticking off the bucket list. It started really good and it ended well. There were hiccups along the way but overall it’s a year to celebrate and remember. Here’s my 16 best travel moments in 2016. Zamboanga is definitely one of my favorite cities in the Philippines. The colorful vintas, the sumptuous food, and the friendly people make it easy to love Zamboanga City. I always look forward in visiting the Latin City of Zambo especially during the Zamboanga Hermosa Festival. In September, we launched the #GoMindaNow project along with three other social media influencers in Davao City. The project aims to promote the many attractions of Mindanao. It’s an advocacy to help boost the Mindanao Tourism in partnership with Department of Tourism Mindanao. It wasn’t a planned trip. I had to stay in Manila for a while so instead of spending the holiday in the busy metro I decided to join a team of travelers to explore Palaui. Thanks to Harry Balais of LegendHarry Travels for making the trip to Palaui possible. It was my first and I enjoyed it a lot. I also made friends with my fellow travelers. We went there as strangers and we came back to Manila as friends. This year’s Kadayawan was special. My group, the Davao Digital Influencers, Inc. was chosen as the official social media partner of the event. I was also able to meet new friends from all over the country. Bangkok is a haven for good food. One of my favorite food trip destinations in Asia, indeed. I love the authentic pad Thai, Thai chicken rice, oyster cake and a lot more! One thing I love about Melaka aside from the historical sites is the food. It was weekend when we went there so there was an array of food display in Jonker Street. Man, the street food were so delish! 10. The birth of Davao Digital Influencers, Inc.
One of the best things that happened in 2016 is the formulation of Davao Digital Influencers, Inc.(DDI) – a SEC-registered group of passionate influencers in Davao City. Yous truly is one of the founders and the current President of the organization. It’s been almost two years since I was stuck with my #PHL81 project and I thought it would be nice to kick it off again in Sulu, the last province I visited in Mindanao. The province of Sulu became my instant favorite. I explored the least visited province in the Philippines. Last time I was in Hong Kong, I wasn’t able to explore it. This year, I went there again with a friend and still I wasn’t able to tour around. My friend and I decided to just chill and just walked around near Marco Polo Hong Kong where we stayed. We explored some parts but not that much. It wasn’t extraordinary but I’d say it’s still a trip to remember. I am definitely coming back to Myanmar. It was such a great experience to explore a little bit of Bagan – a UNESCO World Heritage Site. Chasing sunrise and sunset in this lovely town was phenomenal. It was my first visit to Indonesia and decided to go to Borneo and visit the city of Pontianak. It wasn’t a popular tourist destination but I still went there to explore it a little bit, mainly because of the equatorial marker. Aside from the marker, there are also other interesting structures and attractions in the city. Don’t worry I will be blogging about it soon. I finally visited all the 10 ASEAN member countries with my last stop in Brunei. I thought it would be boring but it wasn’t. I met fellow Filipino travelers and some Overseas Filipino Workers in Bandar Seri Begawan and it was such an amazing experience to share stories with them. The owner of the hostel I stayed were Filipinos so I really felt at home. One of the highlights during my second visit to Japan last summer is fruit picking in Yamanashi. It was just a dream before and it became a reality. I initially wanted apple picking but it wasn’t available yet so I opted for grapes. It was an unexpected trip to Japan. I got invited by Jetstar Japan to join their inaugural Manila-Tokyo flight. I almost did not make it. My visa arrived late in the afternoon and our flight was at 2AM the following morning. I thought I wouldn’t make it but I did. I can’t describe the feeling. I always wanted to go to Japan and Jetstar made it happen. Thank you so much Jetstar Japan for an awesome trip to land of the rising sun! It was another unanticipated trip to Japan, this time it was made possible by Cebu Pacific Air and Universal Studios Japan. It was my first autumn experience so imagine how ecstatic I was when we landed in Osaka. It’s for the books! This year’s biggest accomplishment is completing the PHL81 project. I finally visited all the 81 provinces in the Philippines. I chose Kalinga to be my last stop and got inked by Apo Whang Od. Thank you Albert Realto for accompanying me in my last three provinces. I appreciate it a lot. We’ve had ups and downs during the trip but we remained friends. Thank you for everything! Photos below by Albert. I’ll kick off the year with a winter trip to Japan. This time I’ll spend most of my stay in Hokkaido. Then, I’ll be exploring more of Mindanaoon the first and second quarter. Later in the year, I plan to visit South America depending on the circumstances. I hope it will push through, if not, maybe in the next years to come. Thank you everyone for making my 2016 colorful and wonderful. 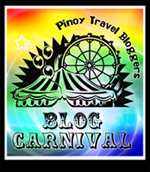 This is my entry for Pinoy Travel Bloggers’ Blog Carnival for the month of December with the theme “2016 : This Year in Travel” hosted by Mervz of Pinoy Adventurista.